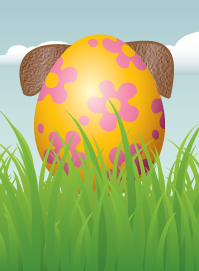 We all like spend time with our loved ones and feast over the Easter break, our pets included. At these family gatherings our pet’s look up at us with pleading puppy-dog eyes and who can blame them? As Easter approaches the thought of chocolate Easter eggs almost has me drooling; let alone if I had to watch everyone else hunt for the sweet-smelling wrapped balls hidden in the garden and lick their paws! Nevertheless, for the safety of our pets we must resist giving them Easter eggs because chocolate is highly toxic to animals. Thankfully, we can feed them a safer alternative so they remain a part of our celebratory feast; as they beg at our feet we can give them a special homemade treat! Preheat an oven to 150 degrees Celsius. Gather 6 cups of white rice flour, 1/8 cup of peanut oil, 1/8 cup of margarine, 1 tablespoon of brown sugar, 15 grams of carob chips, melted with 1 cup of water, ¼ cup of molasses, ½ cup of powdered milk. First stir all the dry ingredients in a bowl, then add the wet ingredients and mix until blended. The resulting dough will be stiff. Chill it in the fridge then use a rolling pin until the dough is 2.5cm thick. 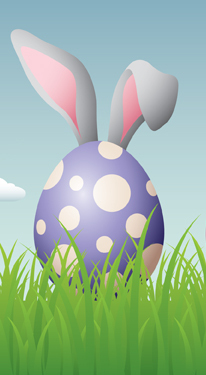 Use an oval shaped cookie cutter or try your hand at cutting Easter egg shapes in the dough with a knife. Place biscuits on a greased tray and bake for 1 hour. To prepare; drain 1 can of tuna, cut up enough turkey or chicken to fill half a cup and measure 1/3 cup of any dry cat food. Adding an assortment of cat-friendly sliced vegetables is optional. Mix all the ingredients in a bowl, before forming small balls with the mixture. Try rolling a small portion on a flat surface with the palm of your hand to get a well-rounded ball shape. Chill in the fridge for approximately 1 hour. As a final touch, roll in breadcrumbs to imitate a crumbly Easter wrapper. Pick a selection of your bunny’s favourite fruits and vegetables, such as apple, carrot and lettuce. Cut up enough pieces of the assortment to fill 1 cup. To create a paste you need ¼ cup of banana and some water; mix together until creamy. Using a spoon put dollops of the banana paste onto a tray, at a size you desire. Use the back of the spoon to smooth the paste down flat into an oval shape. Decorate the ovals by placing the other fruit and vegetables on top. Get creative by using the unique colours and shapes of the toppings to decorate the banana paste patties like Easter egg wrappers. Place tray in the freezer for half an hour so the ingredients bind together, then serve your Easter Frozen Fruit Treats. Easter is a time to treat ourselves and with these homemade recipes your pet can enjoy Easter eggs too – the pet-friendly treat type, not the dangerous chocolate kind for humans! Thank you, I was going to buy some treats, will definitely not do so now. Am going to make the dog Easter Breakfast Brown Bake and the cat Easter Ball :) Grand children are going to love help making these.